Canoe Ridge Creations: a mini quilt. remember when the excitement of Denise Schmidt's first Joann's fabric line was all the buzz in quilty blogland? it was pretty much everywhere, so of course i had to get me some! between 3 stores (the closest one was over an hour away) and the help of one awesome uncle (thanks, kevin!) i was able to get my hands on the entire first collection. and then i made this quilt top, remember? i loved it! but my momentum fell short of a finish because i just couldn't decide on how to quilt it. i loved how traditional the quilt top looks -- with the color scheme and design, but i wanted to make sure the quilting reflected my love for all things modern. at the time, i just couldn't decide so i tucked it away hoping that some day inspiration would strike. enter: amylouwho and show & tell mini quilt challenge. at sewing summit, we ALL were inspired by Amanda of hey, porkchop!. she has such an eye for color and design and it sure shows in her mini quilts. and, she is the inspiration behind the mini quilt challenge. during her SS class (which was more like motivational quilting 101), amanda talked about two different things that really stood out in my mind--to have your mini quilt tell a story and to not be afraid to try new quilting on your mini quilts because it's a great way to "test run" for a larger project. light bulb! can you see where i'm going with this? so for this mini quilt challenge i decided to make a mini quilt using some left over blocks from that DS quilt top i mentioned. i figured it would be a great way to use up some scraps and i could finally try some ideas on quilting the big quilt top. and yesterday i accomplished both. in a matter of minutes (literally!) i had my mini quilt top sewn together. it's amazing how fast it goes when all of the blocks are already sewn! and for the quilting. well, i actually just went for it. i knew i wanted to stick with straight-line quilting because i love how modern it looks. 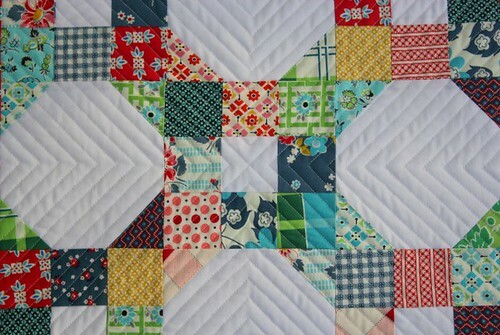 and for some reason or another, i just decided to quilt a big X through the entire mini and then echo the lines outward. this was my first time quilting with a design like this, and it won't be my last! it was so relaxing to follow the straight lines and then have a rad quilting design in the end! i bound this little mini with one of my favorite prints from that first DS fabric line. i love that little pop of red! So cute Megan! I love the quilting! 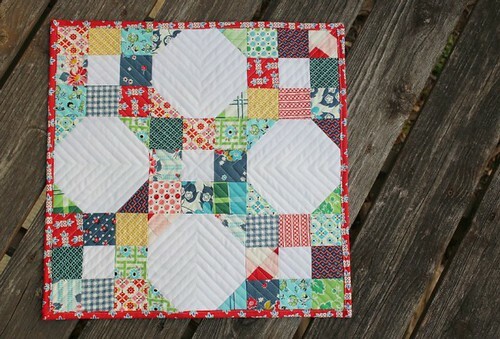 Ooooh, I hope you do this quilting with your big quilt, too, it turned out really lovely! Great job! oh, the quilting just makes it perfect - love love love it! I really love the quilting you choose! snowballs and nine-patches make such a fun combination! your piecework is lovely and the quilting complements it very well. thanks for showing it to us! 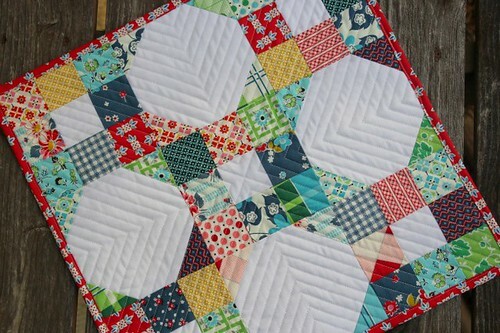 Love the quilting and all those yummy DS prints look amazing in this design Megan! Great little mini Megan! Love the design and the quilting is awesome. Great job! Such an awesome mini! I love the quilting. Perfecto. Hi Megan! That was a great idea to make a mini quilt and try the quilting there! And your mini quilt and quilting became out just fantastic! That quilting is really beautiful and modern! That red is definitely my favorite of the line, too. Your mini is fabulous and the quilting is unbelievable! Excellent work, dear! Really cute! I loved that quilt top, and this mini is so sweet. Great job! Now go finish up its big sister, eh?? Love this mini!! The quilting looks fabulous! Very cute. I love that quilting pattern too - just used it myself on my full-size Swoon. Oh, how I love your mini! Your quilting is perfect for it. I really wish I had some of that fabric. This turned out so cute!!! I absolutely love this! I have a few of the prints from that line, but I wasn't able to get all of it. They are sitting out on my table and I'm waiting for them to tell me what they want to be. Now you have inspired me to try free motion quilting or straight line quilting on my first 'quilt' which is a mini quilt. That is wonderful. WOW, great mini! I love the quilting! Quilting is adorable way. I think it will be more attractive to create in big quilt. Your quilt is mini, but it is too marvelous, for me it is inspirational.